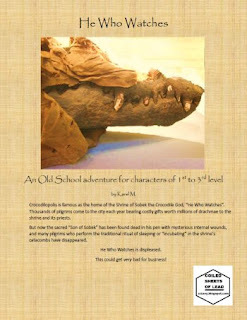 He Who Watches is an Egyptian themed adventure from Karel M of Coiled Sheet of Lead Games. By Egyptian themed, I mean apparently literally set in Egypt, though a relatively modern one (Roman era), not just an Egyptian like country. I had a very strong sense of deja vu while reading it, because I had read a very similar short story in a book of historical mysteries (Chosen of the Nile by Mary Reed and Eric Mayer in The Mammoth Book of Egyptian Whodunnits). 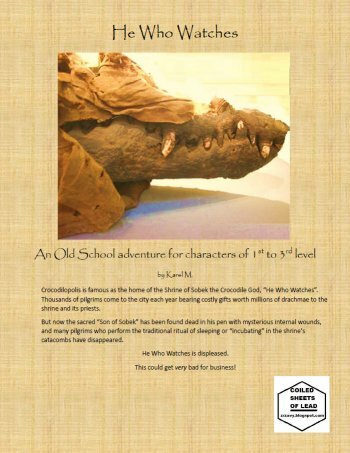 It's meant for lower level PCs (no system is expressly given, but seems 1e-ish) and set in the city of Crocodilopolis (the Greek name, original name Shedet), essentially the plot is that pilgrims to a temple of Sobek (a crocodile god that is a good protector god of the dead) are going missing, and the PCs are hired to investigate. A subplot is that one of the holy crocodiles has just died. GW3 Cleansing War of Garik Blackhand - Gamma World module about his fight vs the cult of Mr. Clean. $4.99 and 38 pages, also available in print. Polyhedron 26 and 27 - 99 cents each. Actually has something interesting, what's happening in Gamma World on Mars (both issues). Also, considering the City of Brass is a 1e location, this is editional appropriation (on top of a cash grab for a reprint). In Vino Gigantus - I think this describes the cost of this adventure from Frog God. $8 for 16 pages. 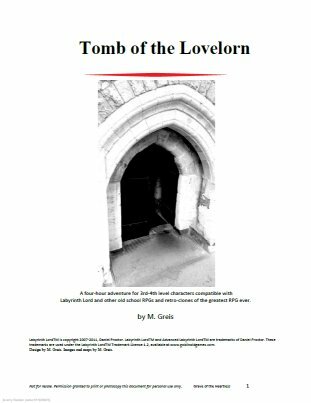 Tomb of the Lovelorn is a short dungeon from M. Greis for lowish (3rd to 4th) level Labyrinth Lord characters, though there is some fuzziness in both the system and level range. Apparently it was originally written for a Danish RPG convention and translated into English, and although it's quire readable, it does have some odd phrasings and many minor errors. While it's a tomb crawl, it's definitely an unusual one, with no standard undead. Instead its basically a prison created by an evil magic-user to keep his romantic rival in a state of undeath, to prevent him from being reunited in death with his lover (that the evil magic-user also fancied). This is done by two undead crypt keepers, who apparently abduct nearby residents and "feed" them to the imprisoned lover, who has become a giant blog of flesh. Just writing the date, 2019, makes me think "Hey, we're in the future". But something not from the future, but the past, is the 30th Edition of the Arcanum, which was like the 2nd edition of Bard Games Atlantean Trilogy (and in term a successor of the Compleat ____ products). GW4: The Mind Masters - Old Gamma World module. Not sure which edition. $4.99 and 36 pages, also print version. Polyhedron 24, 25 - TSR's old house zine. 99 cents each. Sunday's Hand-Drawn Pyramid Adventure - From Sharp Mountain Games comes something a bit different, a pyramid themed adventure, though it still had battle maps and what not. $2.50, 25 pages. Friday Enhanced Map 2-8-19 - Looks like a manor house. Cantrips! Zero-level spells. I remember when they first came out in Dragon magazine and found them fascinating, they were something of a more practical use of magic, with spells to clean and dust and pull pranks. But to actually use them in your AD&D game, your MU would have to give up a 1st level spell, and frankly, there's just too many useful 1st level spells for a MU to do that, even at mid to high levels. So it was basically a neat idea that was quickly forgotten, except in special cases (like 0-Level characters). 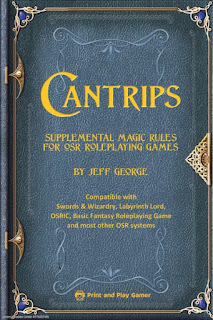 Cantrips did make a reappearance in the 3rd edition of the game (and in 5th), where they became spells cast in addition to 1st level spells, and some of the crappier 1st level spells were shifted downward (such as light and mending). It actually went a long way to making 1st level (or even 2nd) MUs be more useful, but they largely escaped a re-emergence in the OSR. 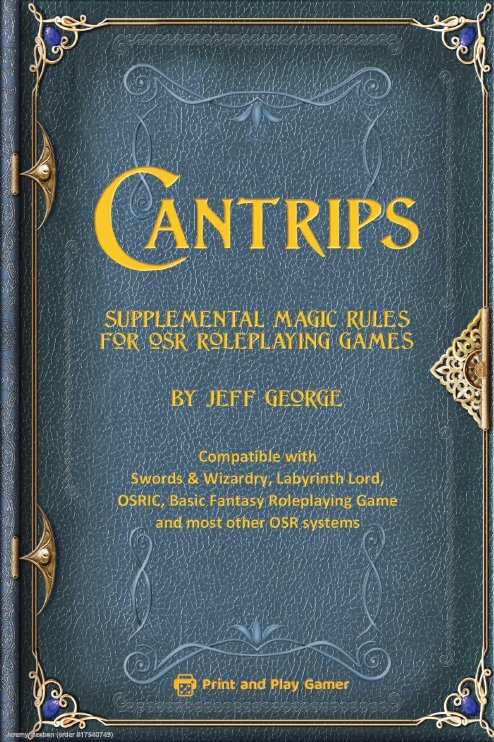 At least until now, with Cantrips: Supplemental Magic Rules for OSR Roleplaying Games by Jeff George, which is $1.99 for 32 single column pages and usable for all major flavors of OSR. This is more like 2 weeks, since I missed one due to DTRPG's problems. Rats in the Walls and Other Perils - Revising the old AS&SH adventure with a couple more old adventures. $10, 44 pages. AS&SH 2e Player's Manual - I don't know if they fixed the rules problems in from 1e AS&SH, but they certainly did break the art. Don't need this if you have the full book. $12, 300 pages. Cantrips: OSR Magic Supplement - EGG added these to 1st edition in place of a 1st level spell, but I think it would have made more sense for them to be in addition to. Presumably the author of this supplement agrees. $1.99 and 32 pages. AS&SH Referee's Screen - For 2e, I guess. Do not like the comic book of the AS&SH line, so much lamer than the pulp art style of the original. $10 and 8 pages. Although I am not a fan of the Adventurer Conqueror King System, from Autarch, I was deeply impressed by their first module (besides Dwimmermount that is) that supported their system, The Sinister Stone of Sakkara, which was a nice take on the Keep on the Borderlands type scenario. 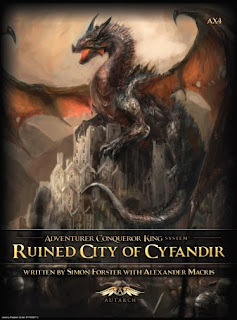 So I quickly picked up this, Ruined City of Cyfandir as soon as I noticed it was out. 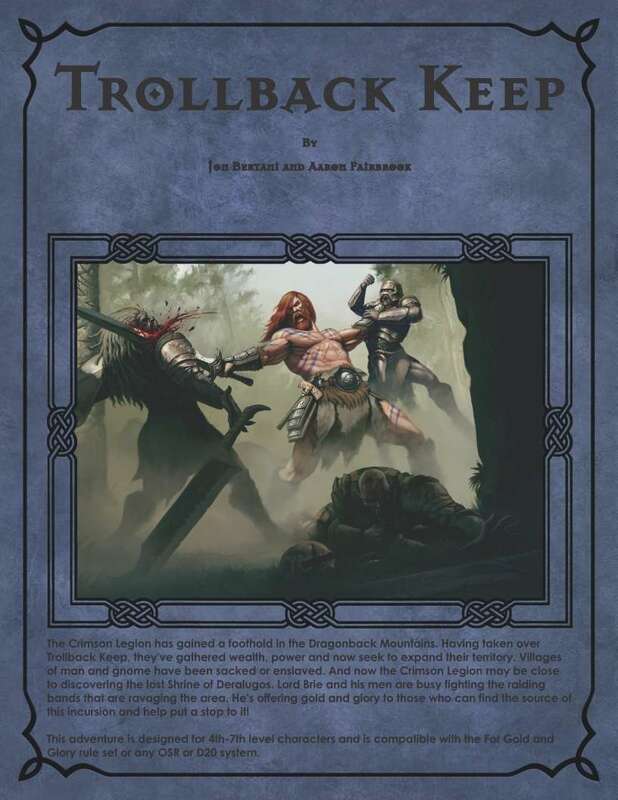 It's meant for levels 5 to 7 and for ACKs (so probably a little higher level for Basic/Original games) and is 30 pages for $4 in PDF. The premise is simple enough, an elven city was overrun by a dragon and her lizardman followers. 200 years later, they are still there. The PCs either stumble upon the city or are sent there. Presumably they explore and loot. There's only about 25 or so special locations in the city itself, most of which deal with lizardmen or the newly arrived goblin tribe.